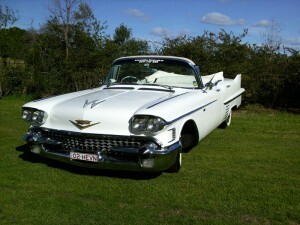 CADILLAC HEAVEN is one of the few wedding and formal car hire companies that can offer 2 rare & matching and the ever so popular classic 1958 & 1959 White 4-Door Cadillac Convertibles. The cars are sophisticated, charming and extremely romantic. You will be more than impressed with their immaculate presentation. Our Cadillacs can seat 5 passengers plus the driver and our drivers are well presented and uniformed. All cars are white, convertible and because all cars have 4 doors, getting in and out is very practical. We welcome you to view our Cadillacs. Arrange an appointment to view the cars and discuss your requirements for your special day. Priscilla is a very popular lady. 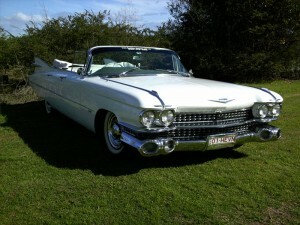 She is a Cadillac DeVille Convertible and was born in 1958. She is full of romance and loaded with a whole lot of fun too. Feel the beautiful breeze through your hair as Priscilla cruises you through the streets. You’ll be the centre of attention. Peggy-Sue, the leader of the pack is a unique 1959 Cadillac Convertible also in traditional white. With her gorgeous white upholstery and plenty of shiny chrome, she will look fantastic in your photo album.